Even by my standards, last night’s MTV Video Music Awards show was tough to watch. From the raunchiness of Miley Cyrus to the constant censoring of cuss words to Nicki Minaj’s uncivil attack on the celebrity just mentioned, the show certainly didn’t leave me inspired. However, even without those three unfortunate occurrences, the Kanye West debacle was enough to soil the show. Let me make this confession right off the bat. I tuned in live last night (with the standard delay) and watched Kanye accept his award with the rest of the Twitterverse. However, since then, I have not re-watched it nor read any reactions to it. I opted to do this because no one should have to listen to his rambling ego fest even once, let alone twice. With that said, I do know that I might have missed something or misinterpreted what he said. If you see that I have done that, please let me know. I was so disappointed in Kanye West. I thought the stage was set for a great moment. Taylor Swift did an awesome job introducing him and downplaying the unfortunate incident from several years ago with both humor and sincerity. The camera shots of Kanye during Taylor’s intro led me to believe that he would match the grace of the person he put down half a decade ago. When Kanye walked up to the stage, hugged Swift, and took the award I thought his speech would have substance and humility. …but then it turned bad. Real bad. The build up to what I thought was going to be a touching moment proved to be the build up for a self-promoting, finger pointing rant. He tried to justify the Taylor Swift incident by saying that he feels he must fight for artists, even if it means putting down other artists. This proclamation led him off on a bizarre tangent where he criticized award shows and MTV. He was especially brutal on the latter, blaming the network (as he stood on their stage) for magnifying his embarrassing actions toward Swift. He rambled on and on, no one quite knew what he would say next or when he would cease talking. About midway through, Mr. West admitted to being drunk when he hijacked Swift’s award speech. He then admitted to being high at that very moment as he once again humiliated himself on that same MTV stage. He wasn’t the only one humiliated though. How do you think MTV felt at this moment? The station was awarding this guy with not only a trophy but an outlet to speak to millions of people worldwide and what does he do? He bashes them. Under the influence of drugs. Ouch. You know what I hated most about the speech though? People who know me don’t have to think twice about the answer…the constant use of the word “bro.” I have detested the phrase even before t-shirt makers started to put it at the end of every phrase. Even before “Jersey Shore” drove the phrase into the ground with idiotic, excessive usage. Even before uncreative people started to use it while in conversation with females. It sounds so unintelligent and condescending. Kanye probably uttered the phrase ten different times last night. I cringed each and every time. It was the awkward, long winded speech that would never end. It pretty much epitomized the 2015 VMAs. How bad was it? Notice how I didn’t include the link in this post? Well, I wanted to do you a favor. Class it up, Kanye. Don’t Blink. Quite often people ask me questions about my blog. Whether it be in person, through text, or through the comment feature on brentreser.com, it seems like I always receive some of the same ones over and over again. For my Sunday blog post, I thought I would open up the mail bag and answer some of them. Today I take the opportunity to answer some questions regarding my blog. Q. How do you find time to devote as much time as you do to your blog? A. I simply budget it into my day. On my weekday blog posts, I begin writing as soon as I get home from work. I won’t eat dinner until I publish whatever I am writing that day. To me, it doesn’t seem like my blog takes away that much of my time just because it is a major project of mine that I enjoy working on. As I mentioned in a previous blog post, I probably spend about 40 hours on Don’t Blink a month. Q. How much time does it take you to write a single blog post? A. This definitely depends. Blog posts where I incorporate a lot of images take considerably longer than Thursday Rundown posts. Posts where I recap a trip or experience will take longer than a post where I am just spitting out my thoughts on a certain subject. The length of time it takes me to write a post ranges anywhere from 30 minutes to two hours. Like I said, I hop on my writing the second I get home from work. Sometimes I will start the next day’s blog post before I go to bed the previous night just so I don’t have to spend as much time on it when I return home. Q. Where do you get your blog post ideas? A. Pretty much from everywhere. I read a lot. I have much of my life documented to the point of every small detail. I also do a lot in my free time that translates into blog content. I become inspired with ideas from my work, my family, and my friends. Social media and current events play a role. Food is always a great source for my ideas. Of course my readers provide suggestions as well. Q. What are your favorite blog posts to write? A. No question, my features I do on people. These are always special for me to write and then special for that particular person to read. The posts I do on people are the most raw, passionate pieces I do. Of course Thursday Rundowns are fun too because they are so random and easy to write. From feedback I have gathered I also know that my readers really enjoy those particular posts as well. Q. Can you get a little more specific? Are there any posts that specifically stand out to you? A. Most recently, the series I did on the Sean Carty saga registers high. Not only did those posts bring in a crazy amount of traffic, but they helped (at least a little bit) a man retain his job. The post I did on former Montana athletic director Jim O’Day also is a favorite of mine. If you want some more specifics, check out this post I did at the end of last year chronicling my top ten favorite posts from 2014. Q. Do people actually read your blog? A. Although I took a swipe at my readership numbers in this blog post, I do somehow have a dedicated following. Although not huge by any means, my site routinely garners a four digit number of views per day. This of course inspires me to write often. Q. What is your blogging schedule? A. I am pretty good at blogging five times per week, Sunday through Thursday. I am now in my fifth year of writing Don’t Blink. Q. When are you finally going to give Don’t Blink up? A. Good question, I don’t really know. I would think that when the day comes that Sidney and I have kids my free time to author a blog might diminish. But right now I am all in. Q. Speaking of Sidney, will she ever takeover your blog again? A. You bet she will! Look for her next post in a couple weeks. Q. Any advice to wannabe bloggers? A. Go for it! Just hold yourself accountable and stick to a schedule. Don’t get discouraged if people aren’t reading it at first. It takes time to build a following. Besides, if you are writing your blog solely for other people you are doing it for the wrong reason. A. Yes, I would like to say one thing…Don’t Blink. A longtime breakfast habit of mine went on hiatus a couple months ago. Many people know that I eat a plain peanut butter sandwich for lunch every single day during the work week. Fewer people know that I used to eat half of a peanut butter sandwich for breakfast according to the same schedule. My PB intake has slipped over the past several weeks as I now eat something different to start my day. Let me explain briefly how this started. In June I did a blog post where I compared premium items to generic items. I used strawberry Pop-Tarts as one of my products. While I left most of the food from the experiment at Sidney’s house, I did take the Pop-Tarts home with me. Later on that work week I had a shortage of bread. Because there was no way I would ever mess with my tradition of eating a peanut butter sandwich for lunch, I decided that I would bring a Pop-Tart package for the Thursday and Friday of that week, forgoing my usual morning meal (I eat breakfast in my office around 7:40 a.m.). 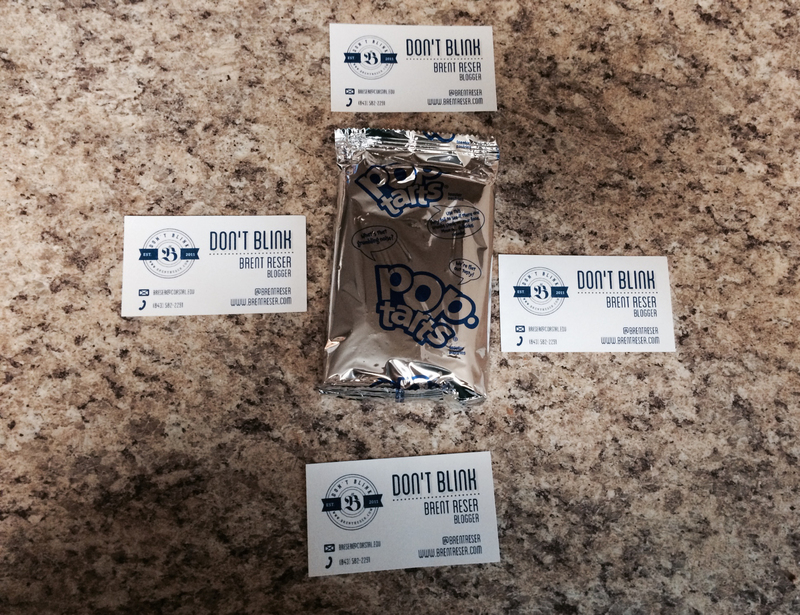 In June, I started bringing Pop-Tart packages just like this to work. After I finished my breakfast on Friday I realized that going with Pop-Tarts was the way go. It saved me time, filled me up more, and of course tasted pretty good! I decided I would start rolling with the pastry bars for breakfast on a trial basis. Since June, I have purchased many different flavors. Combined with my Pop-Tart eating days of my youth, I think I am qualified to present a pretty solid list of my top ten favorite flavors. What do you say I reveal it? 10. Cookie Dough – A cookie dough flavor of anything really can’t count as a breakfast item, especially if it doesn’t even taste like cookie dough. For a guy like me who loves the cookie dough flavor concept I think the Pop-Tart version missed the mark a little bit. They are definitely still edible though. 9. Frosted Cherry – Just edging out raspberry, cherry makes my list as the lowest of the fruit flavors. I will choose these from the grocery store shelf if that is all there is. 8. Red Velvet Cake – I purchased a box of these a few weeks ago. The best part is the soft, very red crust. Besides that, I don’t want to start my day with them too often. 7. Wild Berry – This is the Pop-Tart with purple frosting and hot blue streaks. I think they taste pretty good but what really is a “wild berry”? 6. Frosted Strawberry – When you go to a vending machine and they have Pop-Tarts, this is the flavor they have. If I am not mistaken, the strawberry flavor is pretty much the prototype of the Pop-Tart family. I enjoy them quite a bit. 5. S’mores – Growing up, you could usually find s’mores Pop-Tarts in my mom’s cupboard. When my parents would put them in the toaster, the smell that would engulf the kitchen was glorious. The graham cracker crust was a very unique and tasty feature. 4. Frosted Blueberry – My favorite fruit flavor Pop-Tart for sure, I have also been aesthetically attracted to this particular flavored pastry. The blue sprinkles mixed in with the other colored sprinkles to distinguish the flavor always appealed to me. 3. Peanut Butter – These Pop-Tarts taste exactly like my mom’s peanut butter cookies! I seldom toast/microwave my Pop-Tarts but on that rare occasion where I actually do, this is the flavor I do it for. Did I ever mention that I love peanut butter? 2. Frosted Cinnamon – Along with the s’mores flavor, cinnamon was the other flavor of Pop-Tart you would always find in my mom’s cupboard. The texture and flavor of this Pop-Tart is the best. The fact that most of it is frosted leaving very little exposed crust is also a bonus. I will always eat these. 1. Confetti Cake – I know exactly what you are saying…there is no way this can remotely be justified as a breakfast food. I understand, I understand. But these Pop-Tarts are so incredibly good!! I bought this relatively new flavor (could you imagine if they had these when I was young?) early on in my Pop-Tart breakfast conversion and I couldn’t believe how good they were. While the cookie dough flavor misses the mark in tasting like cookie dough, the confetti cake flavor nails what it means to taste like confetti cake. I make myself feel better by calling it a confetti muffin flavor instead of a confetti cake flavor. I mean come on, a muffin counts as a legitimate breakfast food. 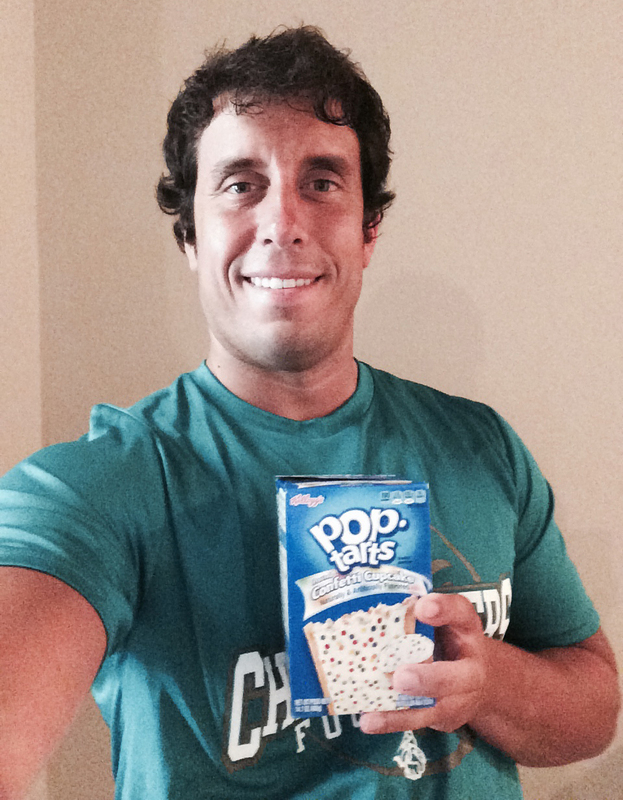 Without a doubt, Confetti Cake Pop-Tarts are my favorite! How about you? What is your go-to Pop-Tart flavor? Get in the debate with me right now though because you never know when I am going to flip the switch and go back to my peanut butter sandwich breakfast diet. Don’t Blink. Another interesting story resulting from social media use recently hit the national news. A dedicated Twitter user boarded a plane for a 50-minute flight. While waiting for the aircraft to take off, she noticed a couple across the aisle from her engaging in an argument. 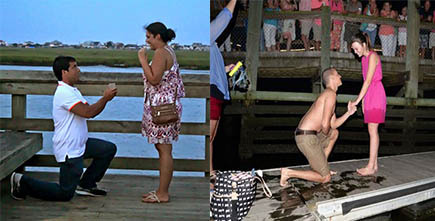 It started to get pretty emotional and heated as the young man and woman discussed ending the relationship right there. This Twitter user, Kelly Keegs, started to live tweet the whole mess. For those not familiar with “live tweeting,” think of it as a descriptive radio play-by-play of an event that happens to be transmitted through social media as opposed to the airwaves. 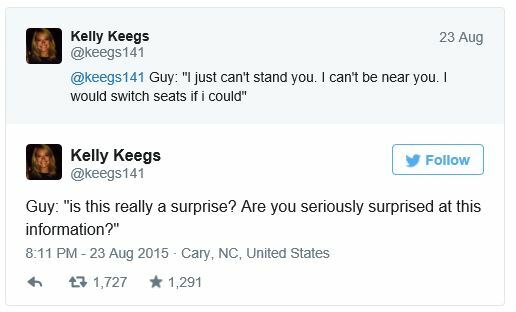 Kelly Keegs recently became a very famous Twitter user. Once the kissing started, the plane was finally ready to take off so Kelly had to power off her phone. Once the aircraft touched down, however, it was right back to Twitter. Kelly reported to her followers that right when the wheels went up, the couple ordered six vodka drinks that they chugged between makeout sessions. What a flight! Just a little sample of Kelly’s play-by-play tweets. Now some people hail Kelly as a Twitter hero. A growing group, however, thinks differently. They label Kelly as a nosey, manipulative, drama queen menace. When I first heard of this story I thought long and hard about the moral dilemmas involved. In my heart I definitely wanted to side with the group who is petitioning for Kelly to be kicked off Twitter. But I feel if I do take a strong stance against her I might seem like a huge hypocrite for two reasons. First, I am a chronic live tweeter. Mind you, I don’t just do it for my job or monumental events. I live tweeted my sister and fiancé going to the movies together. 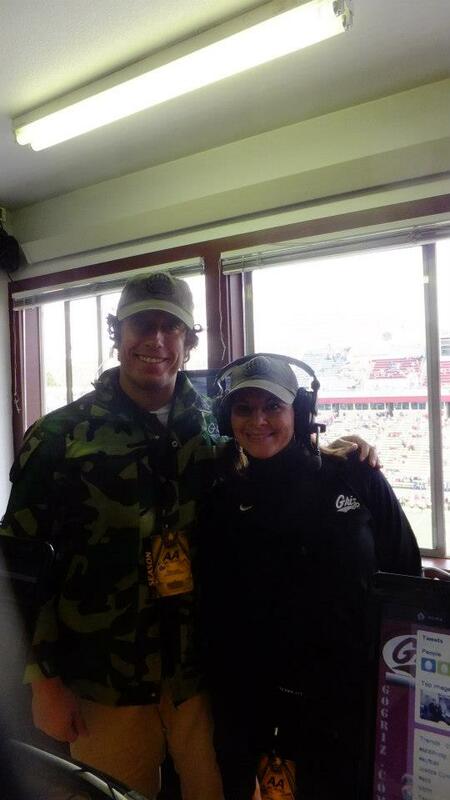 I live tweeted the entire 90 minute special of the 101 Sports Jeers of 2013. I live tweeted my dad shoveling the driveway. Many outraged people out there find the whole concept of live tweeting utterly stupid. Although the more reasonable folks just take issue with the subject matter of what she was live tweeting, I find it hard to strongly criticize someone who engages in the same practice I routinely do. Second, I sometimes tweet out photos of random people. 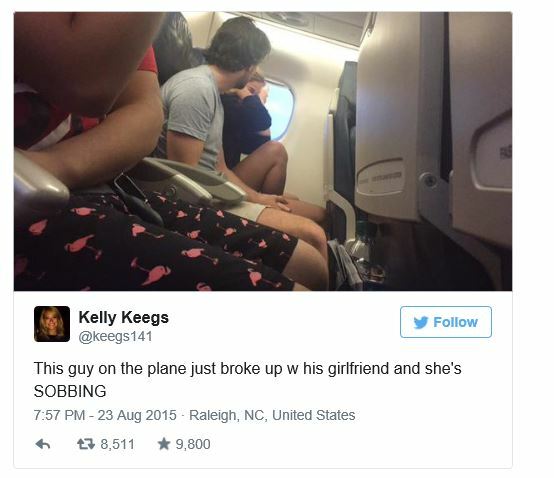 When I saw Kelly’s depiction of the #PlaneBreakup I wanted to immediately blurt out that the tweets themselves were fine but it was the photo of the couple she sneakily took that crossed the line. How could she broadcast what they looked like to her whole social media audience? But then I took a step back. In the past I have also tweeted out photos of strangers doing interesting and bizarre things. I never briefly considered that the image I took of the person holding the dog at the DMV might be retweeted 4,000 times, exposing her identity to everyone. Of course this didn’t happen to me but it did to Kelly (replace the image of the lady at the DMV with the arguing couple). The infamous photo that Kelly Keegs took. 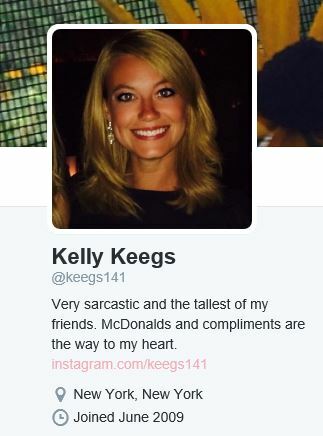 So what this all means is that I can’t say one bad word about Kelly Keegs. Until I change some of my own social media habits, I don’t have the tiniest bit of room to talk. I do think the situation is more unfortunate than funny but that is pretty much all I can say. I have no business calling a fellow Twitter user out. But who I will call out is the airline. Did they really serve the couple SIX vodka drinks?! All at once?! On a 50-minute flight?! I have traveled on flights of that duration before and seen the airline kibosh beverage service completely. To think that they brought an obviously distressed couple that much alcohol seems a little strange. Can someone please cue Dierks Bentley’s “Drunk On a Plane”? I would definitely watch something where a late night show brings the couple AND Kelly Keegs together for a reunion. I would love to see what goes down and what is said. I am sure someone would tweet about it. Don’t Blink. Last night I sat down to watch the 11 p.m. Myrtle Beach local news. 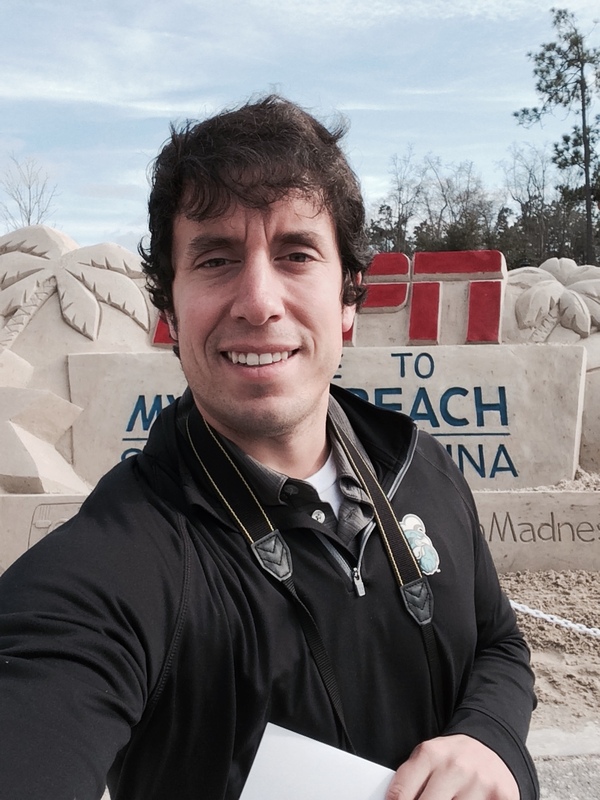 Leading the newscast off was a national story far away from the southeastern coast. 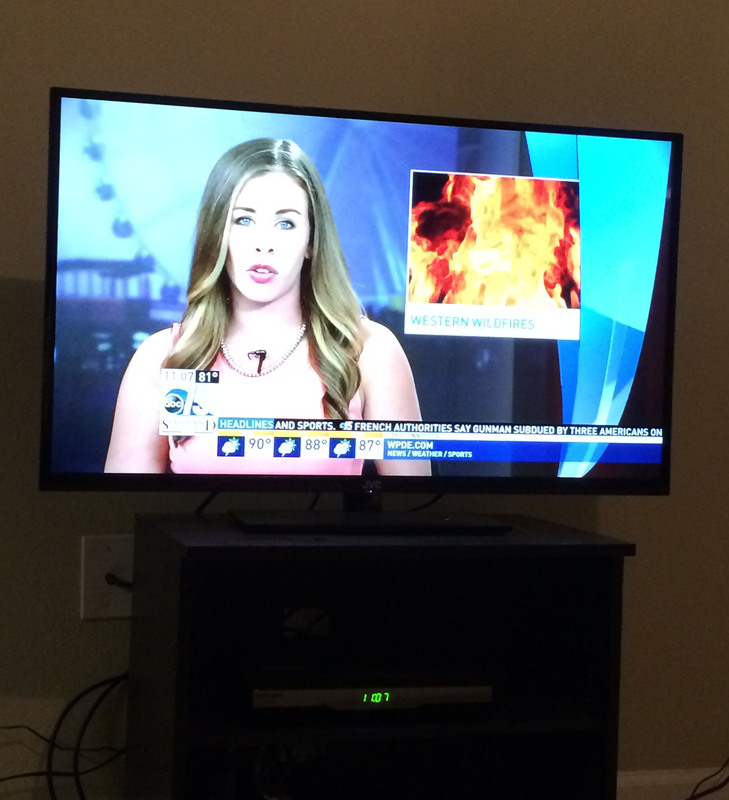 WPDE Anchor Alex Heaton threw the newscast to a taped piece on the ravaging wildfires in Washington state. As I have mentioned before, if national coverage on the area I grew up in doesn’t have to do with our sports teams, it usually isn’t good news. Of course this again was the case. I watched the local Myrtle Beach WPDE broadcast last night as anchorwoman Alex Heaton talked about the Washington state wildfires. I didn’t need the report from the Myrtle Beach station roughly 3,000 miles away from the state of Washington to bring me up to speed on the severity of the situation, however. I follow enough Pacific Northwest twitter accounts and read a couple of online versions of Washington newspapers to know that the wildfires have skyrocketed out of control. But neither social media nor the web has explained to me the carnage as adequately as another source. Every time I have talked with my mom or other members of my immediate family over the past couple weeks all they can talk about at first is how smoky it is. Growing up in Washington state and then living in Montana I have experienced extremely smoky summers. However, my family tells me this year it is at a completely different level. 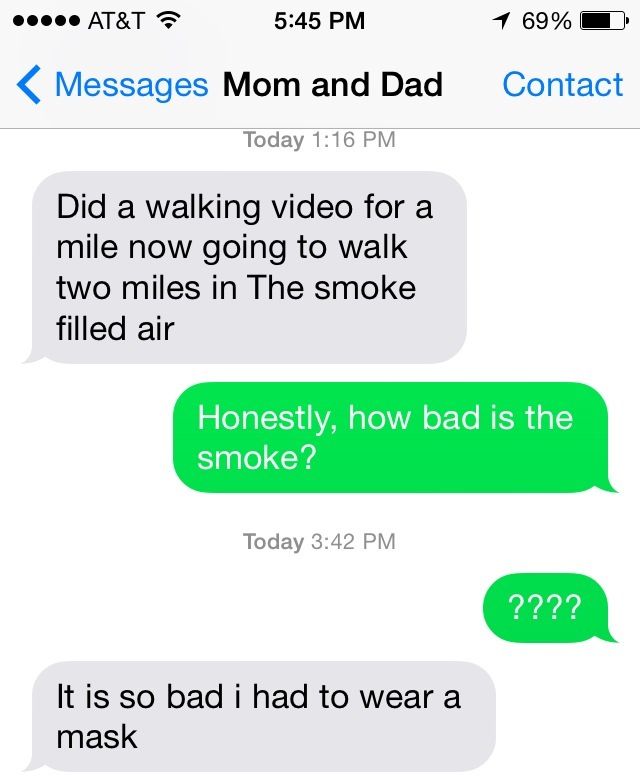 In this text message between my mom and I, she said that it is so smoky in her neck of the woods that she has to wear a mask when taking a walk. When the smoke is so bad you have to wear a mask you know you are living in a place that was rightfully declared in a state of emergency. Well, either that or you look at a map like the one below to see how prevalent this problem really is. 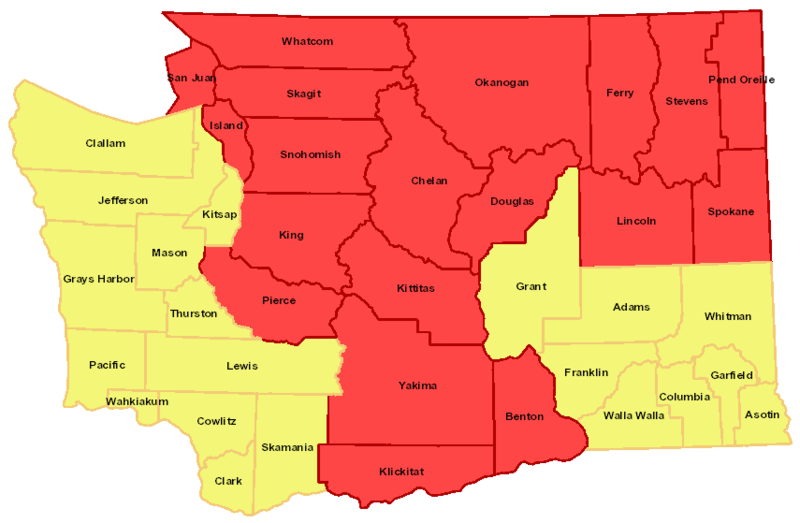 The whole state of Washington is either at high (yellow) or very high/extreme (red) fire danger. Living in a smoky area is a different type of feeling. It immediately puts you in a haze. Everything all of a sudden is viewed through a grayish-orange tint. Yes, everywhere you walk outside smells like a giant campfire but that gets old after a while. You quickly realize that the smell is not coming from a campfire where people are telling stories and roasting marshmallows. Rather, it sets in that the smell is the byproduct of destruction and danger. People have lost their lives and countless houses have burned. My family couldn’t be safer but they do have to deal with the nasty air. I pray for milder temperatures, safety for the firefighters, and some heavy rain. I know we live in a world with greater tragedies than this but it wouldn’t hurt to take a second and think about the state of Washington. Don’t Blink. In the paper this morning I read an editorial describing why kids hate school these days. At the number one spot on this list was fundraising. Although I would probably agree with the author of the editorial when I was actually in school, I don’t share the same thought now. I am sure we all understand the type of fundraising that Mande Wilkes refers to; students at the primary and high school levels selling gifts, coupons, and sweets to generate revenue for a certain cause. We all did it when we were kids and we all see it replicated almost on a daily basis at the entrance to grocery stores, with knocks on our front door, and even sometimes with visits to our offices. Kids are out selling just as rampantly as we were years ago. I dreaded doing fundraisers when I was young. I solicited everything from candy bars to coupon books to trinkets to popcorn to just good ol’ cash donations. But with the age I am at now and the experiences I have gained, I no longer look down on school fundraisers. I feel that enlisting children to fundraise on behalf of their schools is necessary. I believe in this because it teaches many different skills. By sending kids door-to-door it teaches them communication, persuasion, reasoning, and rejection. You know, stuff they won’t exactly learn during a typical day in the classroom. These important ideals will help make our present day youth better future professionals, no matter what career they choose. Yes, school fundraisers, no matter how terrible the product is (Jump Rope 4 Heart pledges are the worst), will help make kids a better asset to the work force. For some, it will even shape their whole careers. Fundraising positions are some of the most important and profitable careers in society today. For some people in these positions, peddling goods for their elementary school was the first experience they had with their future line of work. Selling those tubs of cookie dough to help their school motivated them to work toward a career in development where they now make a lucrative living. I know some folks cringe at the thought of school fundraisers. They feel adults are using kids to do their dirty work, utilizing cute faces and adorable speech impediments to win over the hearts (and wallets) of random people to finance the school district’s agenda. There is some truth in this I but I really do think it is more of a win-win situation as opposed to a one-sided job on the side of the schools. Kids really do learn crucial skills, no matter how painful it is for them at the time. How can all of us who have no school aged children help out? Buy from the kids who have enough guts to approach you with their fundraiser! Ask questions and make them work to secure that sale but always reward them with a purchase. We can all think back to when we were selling. We had the people who made us feel great and the people who made us feel lousy when we knocked on their doors. While both types of folks are important to teaching children about fundraising and sales, let me remind you of this…there are plenty of the latter people already out there. Be the person who builds up the shy kid selling chocolate you will never eat as opposed to sending him away with his head down. Who knows, your encouragement might help him become a fundraising director of a multi-billion dollar company one of these days. Don’t Blink. Golf Lesson – Last night, Sidney and I took our first golf lesson together. I have had a desire to learn how to play properly for a long time now and when I asked Sidney to join me she didn’t hesitate in saying yes. We are taking “couples lessons” through the Golf School of Myrtle Beach at River Oaks Golf Plantation. Our first hour lesson was fun. Although it rained for the first half of it, the weather cleared up for the last 30 minutes. Our instructor is great and hopefully we will continue to learn a lot. In case you are wondering it wasn’t even close, Sidney did much better than me. 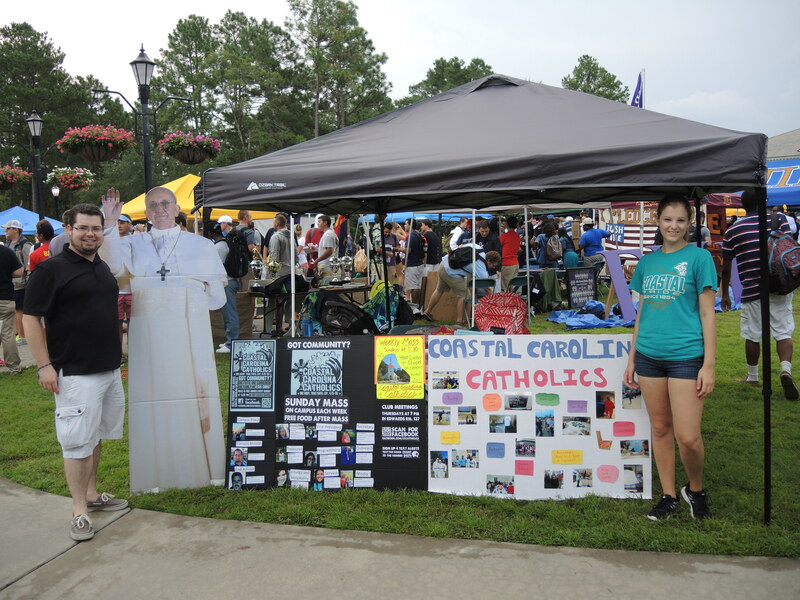 Live Look at College Learning – One of the social media campaigns I have implemented for the academic year at Coastal Carolina University is an “Inside the Classroom” initiative. Each Tuesday I will go inside a classroom here at CCU and document it through our social media channels. If things go as well as they did for the debut of the program this past Tuesday, I am going to have a lot of fun. I started off in a black and white photography class taught by a man named Easton Selby. He was totally welcoming to me and let me do whatever I wanted while class was in session. The access was great but what I enjoyed the most was just getting inside a university classroom again and listening to a professor interact with students. Hearing the natural way Easton chatted with his students made me want to be in college! 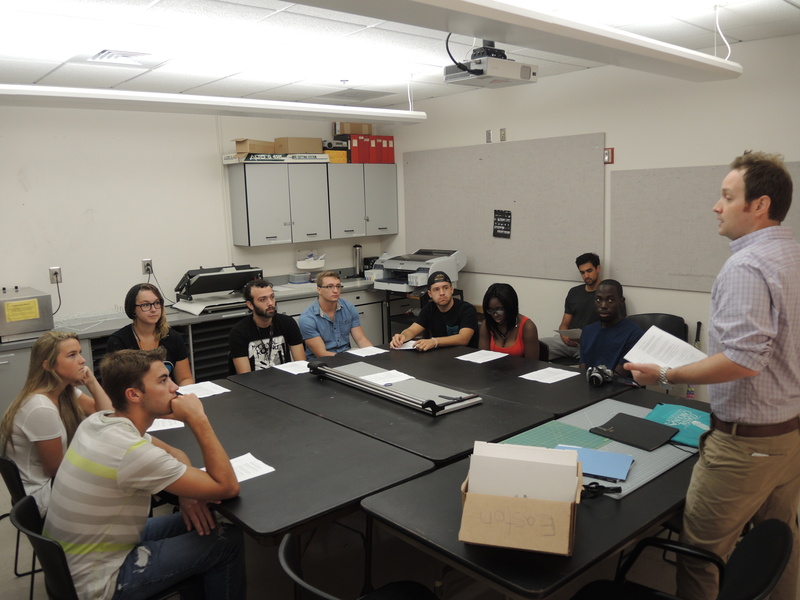 One of the photos I took in Easton Selby’s Intro to Black and White Photography class on Tuesday. School is in Session – This week both Sidney and I welcomed back students. 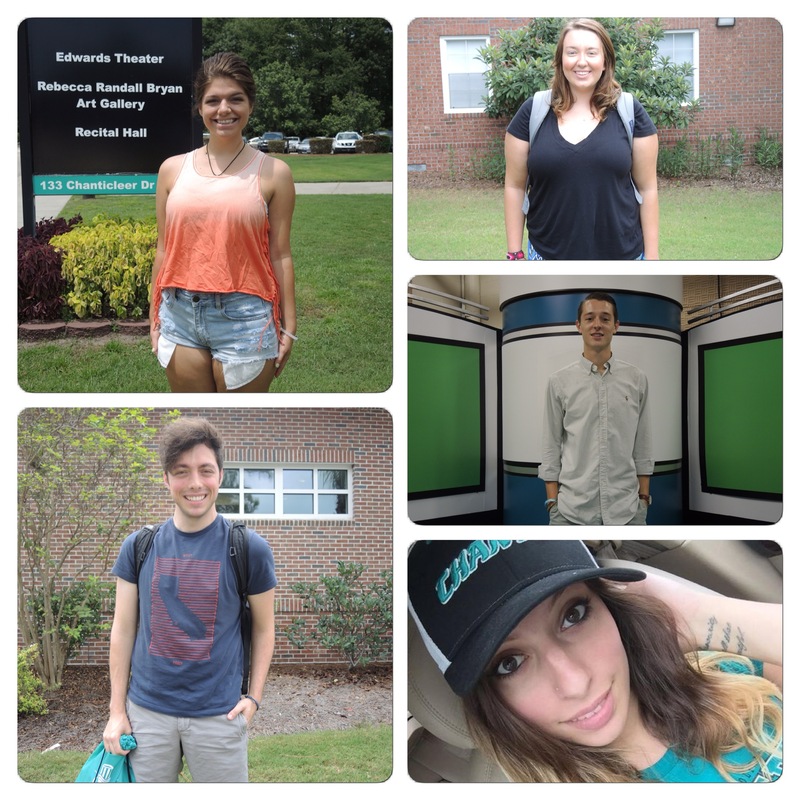 I did so with my role here at Coastal Carolina University. Sidney, however, did so in a more significant way. The first day back for the Horry County School District was today. 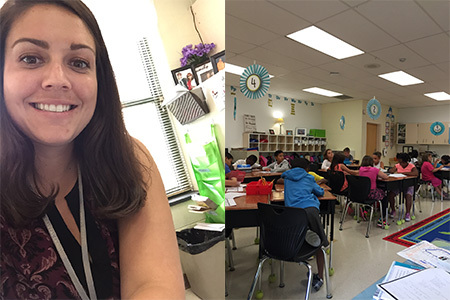 Sidney returns to Palmetto Bays Elementary as a second grade teacher. While she has prepped for the school year to start for the past couple weeks and while she met her students at an open house a couple days ago, nothing compares to that official first day of school. Let me tell you this, those students who walked into her classroom this morning are in for a treat over the next 180 days. I can’t wait to have Sidney guest blog about her teacher experiences! First day of class selfie on the left and Sidney’s class on the right. Pasta Night – Every now and then I like to share an example of my apartment complex doing a cool thing. 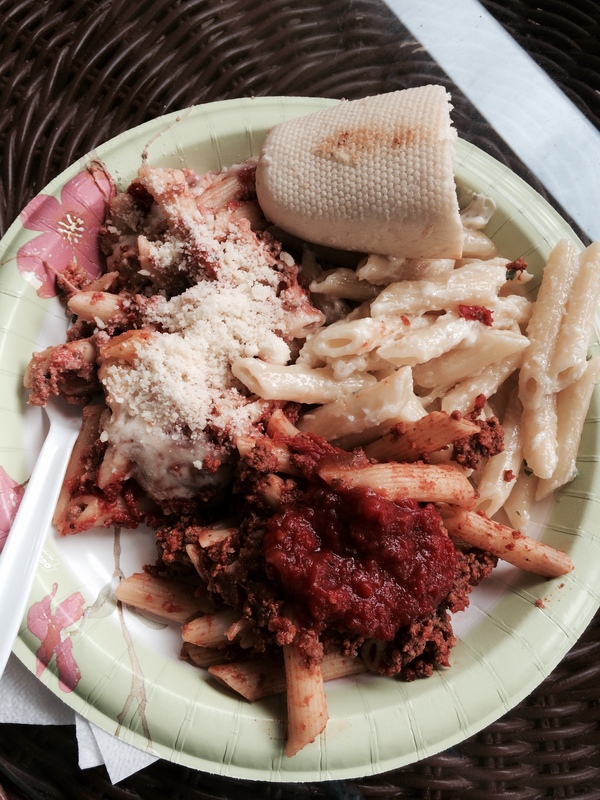 This evening, Alexan Withers Preserve treated us residents to a pasta dinner. We were all invited to the clubhouse and allowed to dish up our plates with a few different varieties. I have enjoyed nice gestures such as this since I moved in almost 16 months ago. Although I can’t wait to live in a house with Sidney once we marry, I am going to enjoy the remaining time I do have here at AWP. My big plate of pasta at the Alexan Withers Preserve Pasta Night. Wedding Update #7 – You can now check wedding invitations off the list! Sidney and I decided upon our design last week. From the Reser family front, my mom and dad explained details of the trip to Myrtle Beach with other immediate family members over dinner last night. My mom also went dress shopping at Nordstrom and I hear she found something that she liked. As always, I thank you all for taking time to read my blog. If you will now excuse me I have to let this pasta settle while getting ready for tonight’s “Big Brother” episode. Don’t Blink. As most people know, I am a little bit off. I like to do things such as browse Wikipedia, take on eating challenges, and eat disgusting cupcakes. I have another interest that I have actually never discussed on this blog before. Get ready to add another tally to my weird column. When I was young, I learned about the saints. I just didn’t learn about who they were, I also learned about the process to become canonized as one. When educated on this long process, I became familiar with a concept called incorruptibility. To check the holiness of prospective saints, church officials would sometimes exhume the body and examine it to see if it had decomposed. If the body had not decayed, the person was said to be incorruptible. As a young kid, the thought of men digging up someone’s grave and opening up the coffin made an impression on me. This impression has stayed with me throughout my life. While at first I felt a little disturbed about someone’s final resting place being disturbed, that feeling of uneasiness has actually turned to a mild fascination over the years. As my well-documented interest in cemeteries grew, so did my interest in the state of physical bodies after death. As I walk on the grounds of graveyards I constantly think about the caskets I am walking above of. What is the contents of those boxes? Corpses? Bones? Dust? A combination of the three? When I watch the reruns of “Forensic Files” I am always intrigued when they exhume a body for evidence. The image of big machinery lifting a casket out of the earth is eerie but interesting. I always think about what must go through the DNA specialist’s mind when doing work on the remains. What about the horror of family members seeing a loved one ripped out of the ground? The other day I was watching an episode where they had to exhume a body in New Orleans. Because of the wet climate, the coffin had sunk in the middle but not at the end where the lady’s head was at. While everywhere from below the neck was gone, the head was intact. Remarkably, the head is what they needed to test. To me, I have just always believed that once the casket is closed during the funeral service, it will stay that way for eternity. The physical contents will sit underground forever. Thus, when the very rare occurrence happens where a body is exhumed, it just seems very unnatural but also remarkable. It reminds me exactly of a time capsule that was never meant to be open. When his casket was opened, an overpowering choking smell flowed out. However, Lincoln’s body was completely intact! His beard, hair, and mole all looked the same as it did three decades prior. I get a kick out of it though that his suit was covered in yellow mold and his gloves had completely rotted away. You could see red fragments mixed in with the mold. Do you know where those fragments came from? It was the remains from the American flag that he was buried in. Whether for religious, DNA, historical, or identification purposes, I am a little drawn to the practice of exhuming bodies. While I hate to see the dead unearthed for no reason, if it is for a good/necessary cause I am going to pay attention. Don’t Blink. Last night, Sidney and I sat down on the couch to watch a movie. Called “Wild Horses,” the film starred Robert Duvall and James Franco. I thought it was okay, Sidney couldn’t stay awake. But the movie itself is an afterthought in all of this. During a scene at the start of the film when Robert Duvall rides his horse to the Texas/Mexico border to settle a disagreement, I suddenly had a vivid memory flood my head. I was taken back to when I was probably four or five years old at the most. I was underneath these old, green metal bleachers at a large field that sat between a middle school and an elementary school. I was playing underneath the bleachers by myself while my mom sat on one of the rows below me, watching my sister. The sights, sounds, and smells were all immediately brought back to me at that minute as I sat on the couch. The funny thing is, I don’t think I had thought of that moment since when it actually happened over 20 years ago. Now I know there must be a psychological term and explanation for this (besides a flashback) but I didn’t want to Google it and take away some of the luster of this blog post. To be completely honest, this has happened to me on multiple occasions in the past few years. I will be engaged in some normal activity when something is triggered in my brain and a completely random thought from a couple decades ago takes over. Another example would be the transportation of my mind back to when I drank grape juice in my mom’s kitchen during a point in my toddler years. My focused self at work seemed to just float away and a scene from the past took over. Suddenly I could remember everything from the taste of the juice to the color of the plastic cup (red) to the design on the kitchen tiles. Again, I had never even scratched the surface of remembering this memory for years until it all came to me at once. What I find fascinating about these random thoughts is that they come out of nowhere when I am fully conscious and seem to be triggered while I am engaged in meaningful activity. Why would a Robert Duvall movie take me back to playing under the bleachers in overgrown grass? Why would sitting in a meeting cause my brain to fetch a scene of me drinking grape juice? I guess you could call these flashbacks but they aren’t really what I have understood flashbacks to be. I go from a non-stressful moment in the present to a non-stressful moment in the past. The moment in the past is the first time I ever remembered it since it had happened. It doesn’t necessarily weird me out, it just makes me think. Does this ever happen to you? Mind you these thoughts always come when I am wide awake and take over my brain with vivid detail. I find this all very interesting and I am excited to see what insignificant moment of my past I get to experience next. Don’t Blink.